Mariel here. When my mom called me on Friday and asked me to put together a pot roast for Passover, I was, at first, pretty confused. “Ummm, mom, we’re not Jewish.” But after a moment’s pause, I realized, I’m not not Jewish either. As my mother mentioned in previous posts, her own upbringing represented a hodgepodge of religious influences: one part Presbyterian, a hefty dose of Catholicism, and then, when she was full-grown, a bissel of Judaism, thanks to my grandmother’s second marriage. My own childhood was punctuated by the same flabbergasting melange of faiths. I spent my formative years frog-hopping between a Protestant Sunday School and the local CCD – aka Central City Dump, as we affectionately called it. From time to time, my grandmother even invited us over to share in Passover Seder, since Judaism remained central to her life long after our beloved grandfather passed away. I grew up unsure of where I fell on the religion spectrum, but I was sure of two things: there is a God, and, like Santa, He’s always watching. So, long story short, that’s the reason two goyim from Westchester are posting a traditional Jewish dish. Happy Passover and mazel tov. And yes, we’ll be posting Easter recipes as well…it wouldn’t be right if it wasn’t confusing. Pssst, if you have a plethora of Pot Roast, try using it in our Winter Beef Stew with Mushrooms & Turnips. Note: This dish can be prepared a day in advance (in fact, I prefer it the second day, after the flavors have had a chance to mingle). 2. In a large Dutch oven or soup pot (over high flame), heat 3 Tablespoons of olive oil and brown the seasoned meat on all sides. Transfer to a platter. 3. In the same pot, add the remaining olive oil and heat over medium-low flame. Saute the onions and carrots, stirring frequently until the onions are limp (about 5 minutes). Stir in the garlic. 4. Add the tomatoes, wine, oregano, beef stock, tomato paste, mustard and brown sugar – bring to a boil. 5. Add the meat to the pot and reduce heat to a simmer. Cover tightly and continue simmering for 3½ to 4 hours or until the meat is extremely tender and shreds easily. 7. Transfer the meat to a platter and keep warm. Continue to simmer the sauce – at this point, make sure to taste and season with salt & pepper. Once sauce has thickened to your liking, correct the seasonings, slice the meat and serve immediately with Latkes. For Matzo Ball Soup and No-Bake Chocolate Matzo Cake recipes, click here. Oh my goodness – this sounds divine, will have to test drive it in my cradle Roman Catholic, slightly Episcopalian and forever Buddhist home! I’m down to 2 meat-eaters, so I can look forward to leftovers. The gravy looks amazing. You make me sooooo hungry!!!! I absolutely love this recipe!! Pot Roast and a hearty side dish is my favorite type of meal. When making pot roasts for dinner, I would recommend trying grass fed Black Angus beef. It is absolutely delicious and a healthier option. I work with La Cense Beef and because our beef is 100% grass fed it is higher in omega 3 acids and lower in calorie and fat as opposed to traditional grain fed beef. Try grass fed Black Angus Beef and you will be able to taste an even bigger difference! Here I am with yet another basic question. A young friend is coming Saturday to spend the ten days with us and I would love to greet her with a Hanukkah dinner. The pot roast sounds perfect, but I don’t know from “red cooking wine.” Yes, at my advanced age, I’m just learning to cook and have lots of questions as basic as this one. Will Marsala do? I bought a big bottle a few weeks ago for a recipe that required only a very little, and I’d love to be able to use it for this if it’s appropriate. Hi Alice- since there are 2 cups of wine in this recipe and because Marsala has such a different flavor, you’ll need to stick with red. If you don’t have red cooking wine in your cupboard, a dry red drinking/table wine like Cabernet or Burgundy would actually be even better! Pot roast is a fav of mine. Considering I’m snowed in, I’d love some right now! 2 cups of wine, garlic and onions? 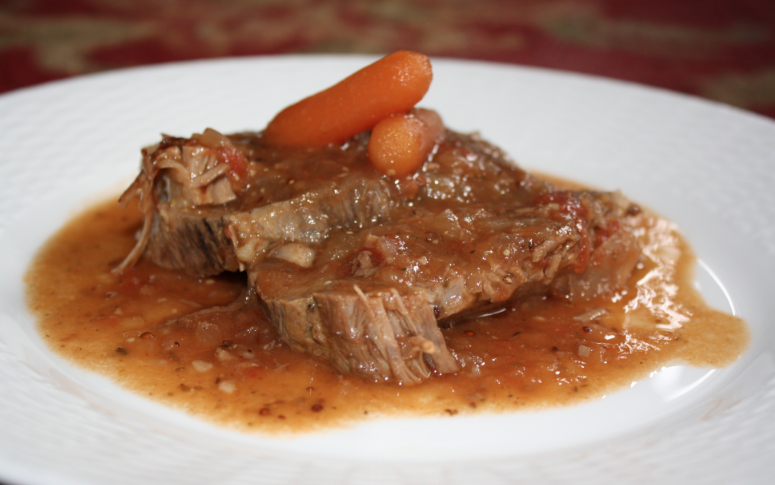 How could this pot roast not taste good? Personally I’m a fan of the ol’ chuck roast for my pot roasts. Is the cut important because it’s a passover roast or for flavor/texture? We had such a great Hanukkah dinner. A friend brought a terrific matzoh ball soup, your potato latkes and this pot roast won rave reviews (the latkes have become my favorite way to prepare potatoes). I found a great honey cake recipe for dessert. Huge success. Thanks for all you have done to enrich my life. I love this site. We are so glad to hear that Alice! And thank you for the Spanish info – I actually whipped up the pot roast last night in the midst of the blizzard using an enormous rump roast. Was craving something rich and hearty. Happy New Year to you and your family, thank you so much for being a Feast follower! I was wondering if this would be god in a crock pot. Doing the sites of meat in pan then put in crock pot.and sautéed the onions and stuff and toss in with roast?